Can You Send Relevant Emails without Opt-In? G-Lock Software > Blog > Can You Send Relevant Emails without Opt-In? One of best email marketing practices says that you need to obtain the recipient's permission before sending emails to them. On the other hand, if you send relevant emails to your customers who purchased your product or used your service in the past, you may not worry about whether they want to receive your emails or not. It's supposed that nobody will complain about a relevant email even if they did not opt-in for it. It sounds promising and opens more potential to email marketers eliminating the risk to be flagged as spammer. Let's dig deeper and see if you can really ignore the permission element in your email marketing campaign. Not all recipients treat marketing emails in the same way. Some consider any marketing email as spam, others treat as spam emails they did not signed up for. And there are those who consider opt-in but not relevant emails as spam. The more you ignore the permission aspect, the more recipients will consider your email as spam. Increasing the relevance of your emails can partially compensate the lack of permission but it won't completely prevent readers from using "Report spam" buttons. It's the ethical aspect of email marketing. Permission is what differs good email marketers from spammers. By asking people for permission to email them we recognize that the Inbox is a private place and that the email address is a private information that can be used by anyone else only with the owner's permission. ISP don't like bulk email if it's not opt-in. If your email generates a number of spam complaints and you don't have a proof that the recipient wants to receive emails from you, you will end up on the ISP's blacklist. It's hard to achieve a high relevancy. Relevancy determines how the recipients will treat your email. If your email is highly relevant and valuable to them, they may ignore the fact that you didn't ask for their permission. But the interpretation of "relevancy" is subjective. We can only guess what people find relevant relying on some facts we know about our recipients. For example, if a customer purchased a program from us in the past, we assume he is interested in the program updates, or in other products doing the similar thing. If you track your email campaigns, look at your open rate to know if your subscribers find your emails relevant or not. Of course, we can allow people select what kind of emails they want to receive from us during the signup process. But it's already asking for permission, isnt' it? If you are hesitating about sending more emails to the whole list, identify your best recipients [those who opened your last email more than one time] and send more frequently to the most active people on your list. 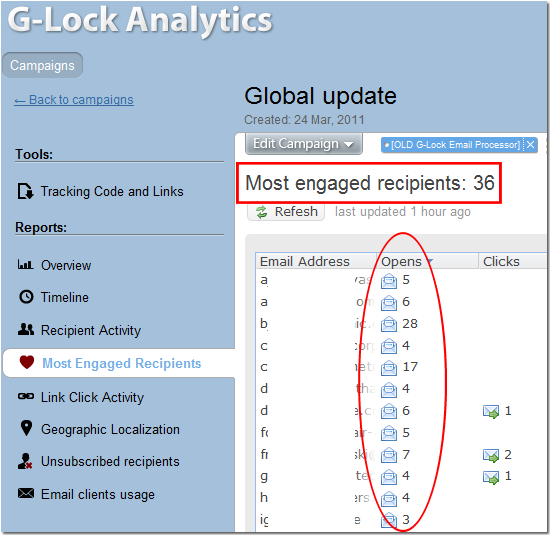 If you use G-Lock Analytics to track emails, you can find your most active recipients under the "Most Engaged Recipients" report. Plus, you can select yourself how the most engaged recipients will be determined — you can set the number of opens/clicks to determine the most engaged recipients in your account. You just export your best subscribers and import them into a seperate group in your email marketing software. These are order confirmation emails, product/service surveys, "thank you" and "welcome" messages, subscription reminders, etc. These emails are initially more relevant than regular marketing email newsletters because they are sent as a response to an action taken by the recipient (purchase, account registration, subscription, download, etc.). Transactional emails usually get a better open rate [not many people report such emails as spam] and can act as a link to more marketing emails. Why not include a link to your signup page into a transactional email and invite customers to join your list? You'll want to make sure that your signup process is running smoothly and that you provide enough benefits to people to subscribe. So, instead of using a risky email marketing tactic such as sending without permission, look for legitimate opportunities to send more emails to your customers and encourage them to subscribe to your list. And be sure NOT to send to those people who deliberately opted out. Download G-Lock EasyMail7 Now, It’s FREE!